Intel will ship the next Centrino platform without an option for the worldwide HSDPA 3G cell standard: The partnership with Nokia was supposed to lead to both Wi-Fi and HSDPA (GSM’s top-speed 3G offering) in a single package. Instead, when Santa Rosa launches in the second quarter of this year, Wi-Fi will ride solo. This is the end of a strategy that dates back to the first Centrino launch when an Intel executive told me that it was inevitable that Wi-Fi and cell would both find their way into the platform. Four years later, no such luck. The bottom line appears to be dollars. Intel told InfoWorld that laptop makers don’t want to pay to have HSDPA integrated in every machine. Intel will consider adding 3G in future platforms, however. Specific manufacturers have chosen to include EVDO and HSDPA embedded in their laptops, but that increases cost and requires consumers or businesses to order specific models. The upshot is that the cell networks lost the chance to avoid subsidizing hundreds of thousands or millions more PC Cards and ExpressCards, and gain a new audience that could flip a switch to gain cell data service. 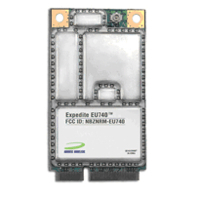 The EU740 is an embeddable PCI Express Mini Card handling HSDPA: These cards are designed for OEMs, or manufacturers of equipment. A Dell or HP would purchase the EU740 from Novatel as a standard feature or add-on option for laptops that use the PCI Express bus. This bus is the wave of the future, no exaggeration, with much higher performance and better parallel operations. It’s found in many of the newest laptops and some desktops that use Intel Core chips, such as Apple’s new MacBook Pro, iMac, and Mac mini models, and laptops from Dell and others. The press release merely points out that the EU740 (and the U740 PC Card) have received certification from a global organization. Certain Lenovo ThinkPads will have built-in Cingular UMTS and HSDPA starting in March: The laptop maker builds on its earlier announcement of an Verizon EVDO modem. This is the latest in a series of agreements among cell operators and laptop makers (Dell, HP, and Lenovo, notably) to incorporate unactivated cell data modems into gear. Buyers of high-end equipment won’t necessarily pay extra to get a model with integrated cell data. They’re more likely to activate it, of course, than if they had to spend $100 to $250 to get a PC Card, manage its driver separately, go to the operator for technical support, and not get a deal for trying it out. Update: On Thursday, HP revealed something they’ve been whispering about for two months: Verizon EVDO will be built into its Compaq nc6140. It’s just $1,400.